Many people dismiss medical billing and coding as simply data entry. Nothing could be further from the truth. Medical billing and coding is like speaking a whole other language; it takes a specialized skill and knowledge in order to perform medical billing and coding efficiently and effectively. Comprehensive Healthcare Revenue Management (CHRM) is one of the best medical billing and coding specialists. We hire experts in our industry in order to best serve our customers’ billing needs. While we handle all medical billing, we specialize in serving some medical practitioners: oncologists, orthopedic surgeons, hospitals, physicians, and free-standing emergency services. We believe specializing allows us to serve our clients better. 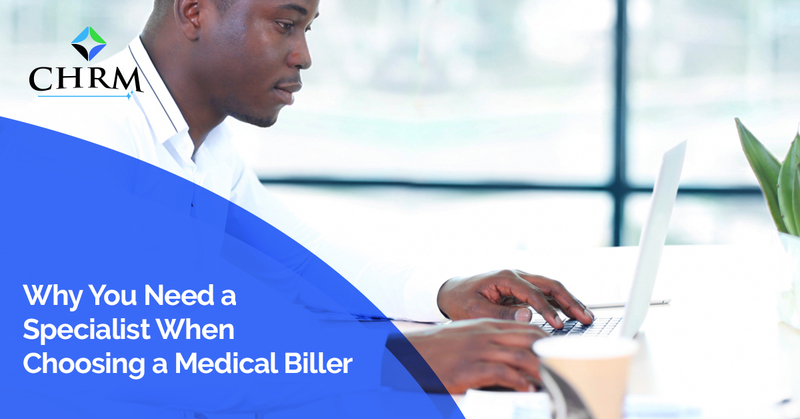 Below, you’ll see a list of the reasons why you should choose a specialized medical biller. Less errors. Maximizing your revenue cycle is the job of an outsourced medical biller, which means less time spent processing errors. When you have medical coders trained in a specialty, such as orthopedic medical billing, you can rest assured your claims will be processed speedily and efficiently. Much of medical billing is just familiarization with the codes and the systems. When you use the same codes all the time, memory kicks in, speeding the process and garnering more reimbursed funds quicker. Familiarity with the business. When a medical coder is familiar with a medical specialty, such as oncology, it’s easier to process codes when you know the services offered. Medical coding can require a lot of research when a service is submitted that is not performed very often. Being familiar with the types of services a medical practice offers can cut down on this research time and get your claim done properly and out sooner. Familiarity with the changing laws. Medical billing and coding changes along with the healthcare laws. In our busy worlds, it can be difficult to keep up with all these changes in laws. Having a medical biller that specializes will allow you to focus on just your industry changes instead of dozens of industry changes. This will ensure your medical biller knows the ins-and-outs of all the changes within your medical field. CHRM understands the challenges of medical billing and coding. There are many pieces to the medical billing industry, and we believe in hiring medical coders with experience in certain areas and in having departments that focus on certain industries. We offer oncology medical billing services and orthopedic medical billing services since both of these specialties are by nature all-encompassing with a diverse set of services offered. We offer medical billing for free-standing emergency services (FSERs). FSERs also makes up a special sect of the medical industry that we feel warrants specialists as well. Hospitals offer the widest range of services, so having medical coding specialists who are generalists is helpful in maximizing the revenue cycle and minimizing denials and appeals. Physician billing, although generalists as well, is specialized enough and the codes are different enough that we feel having specialists in this department also helps our clients in their processes. Comprehensive Healthcare Revenue Management offers our medical billing services to all practitioners. We have a big staff, a few of which are specialists. This assures that our specialists in the medical field get the service they deserve as well as the ability to still serve the generalists. We partner with all of our clients to address any concerns they may have, to help train their staff, to offer reports so they can analyze their particular revenue cycle, and to bring a personal touch to our clients. Our doors are always open. Contact us today for a free assessment of your business and to see if your medical practice is a good fit.